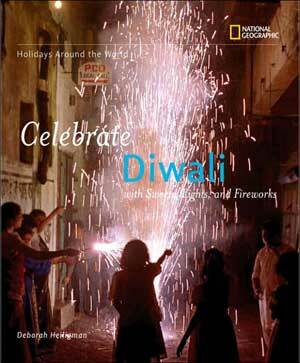 Diwali is a holiday that comes from India. It is celebrated by Hindus around the world. Sikhs and Jains celebrate it, too. As you will see in my book, different people celebrate it in different ways and for different reasons. But there are common themes for everyone: the triumph of good over evil, of light over darkness. Diwali is called THE FESTIVAL OF LIGHTS. The word Diwali is a shortening of Deepavali, which comes from the Sanskrit word dipa, meaning row, and vali, meaning lights. In South India the holiday is called by the original word, Deepavali. Diwali/Deepavali is celebrated in autumn. Some people celebrate for more than one day. When I first started writing this book I had never even heard of Diwali. So to write the book I read a lot, talked to a lot of people (professors, journalists, neighbors, friends, store owners and waiters). I was lucky enough to go to a Diwali party (I hope to go to more!) And I had a wonderful guide in my consultant. (For each book I have a consultant who is an expert in the holiday). For CELEBRATE DIWALI my consultant was Dr. Vasudha Narayanan, who is brilliant, knowledgeable, distinguished and fun. And does she travel! I got e-mails from her when she was in Paris, India, Cambodia and her home in Florida. Visit her web site to learn more about her: http://www.clas.ufl.edu/users/vasu/. The entire collection of Holidays Around the World by National Geographic Society is amazing, however Celebrate Diwali is one of the best of the bunch.